BleachHouseLibrary.ie: BLOG TOUR: 'The Abrupt Physics of Dying' by Paul E.Hardisty. Review and Exclusive author Feature. BLOG TOUR: 'The Abrupt Physics of Dying' by Paul E.Hardisty. Review and Exclusive author Feature. This debut novel introduces the character of Clay Straker to the reader and is a story of industrial pollution in the Middle East. Clay Straker , retired from the South African Armed Forces , has retrained as an engineer and now finds himself working for Petro-Tex , a new kid on the block in the oil industry .Based in Yemen his job involves environmental testing for the company in support of its applications for government approval .This work mainly consists of cash donations to the relevant officials and tribal leaders to smooth the process . The novel starts with the kidnapping of Clay and his Yemeni driver and a face to face meeting with Al Shams , a renowned terrorist in the country.Al Shams is seeking the reason for the recent deterioration of the health of the local population and gives Clay a deadline of one week to highlight their plight . What follows is a page turner which sees Clay taking on the very company he has been promoting and its blatant disregard for the Yemeni tribes . To complicate matters Rania La Tour , a journalist with AFP , seduces Clay in order to get an interview with Al Shams but she too has other motives . Clay becomes a fugitive and soon is fighting for his life and running out of options . Who can he trust and how can he prove Petro-Tex is breaking every rule in its efforts to extract oil from the Yemeni desert? I really enjoyed this novel and found a strong character in Clay Straker . The writing was well paced with plenty of action . As I was reading I was certainly imagining a good movie in the pages and, as is normal, trying to figure out who might play the lead role. I finally settled on Matt Damon . I think there is scope for this character of Clay to appear again in a follow up novel and I look forward to reading more from this author . Definitely a cracking debut . As my dad always used to say, five pounds (dollars) and my advice will buy you a cup of coffee. 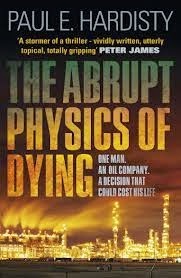 Orenda Books in London has just published my first novel, The Abrupt Physics of Dying. So coming to me for “Tips for New Writers” is like going to an L-plate driver for tips on doing the Dakkar Rally. What I can do is refer an aspiring writer to the thoughts of some other, much more highly qualified sources. In fact, a very quick search will dig up so much advice to writers that if you read it all you’d never actually do the one thing you have to do to be a writer: write. Hemingway said it best: “whatever happened the day or the night before, you’ve got to get up and bite on the nail.” No excuses. Just about everything you’ll find on this subject refers to this one, entirely evident but impossibly difficult reality. No matter what you do, if you don’t actually produce – string words together on the page – you’re not a writer. EH spent a lot of time writing about writing. Many writers have. EH called it a discipline. The discipline of Flaubert. That’s a good word for it, what we do. It wasn’t until I started long-distance endurance sport (triathlon) about fifteen years ago that I found I could actually write long. Triathletes talk about “going long”. The Ironman is a 3.8 km open water swim, 180 km bike, and a 42.2 km run (marathon), back-to-back. Ten plus hours of non-stop racing. To me it’s like writing, like getting published. Before you commit to finishing something like that you don’t think it’s possible. The training commitment alone is outrageous. It takes discipline and a lot of time. But you do it. A lot of the time it hurts like hell, but you keep going. You make a lot of mistakes. You learn. And then one day you’re crossing the finish line, and that’s about what it feels like when you finally hold that published first volume in your hand. The cause and effect is all around you, in the cheering crowds lining the finishing chute, in the smell of the pages the first time you riffle through them, that electricity firing inside you. You decided to do it. You did what was required. And you got there. Hemingway also said: “There is no use writing anything that has been written before unless you can beat it. What a writer has to do is write what hasn’t been written before or beat dead men at what they have done.” To me, that’s the other really important thing: trust your own voice. Of course, so much has been written that it can be a daunting thought. But the possibilities for the written word are infinite – literally never ending. And what has been done is finite. Mathematics proves that the difference between the two, the room for innovation, is still infinite. Martin Amis calls it the ‘War Against Cliché.’ But it’s not easy. I guess that’s the thing about writing – it’s hard. Push yourself across that last ten kilometres when it’s 35 C under a crushing sun and everything hurts and that blister on your right heel has burst and is wearing itself raw and the liquid is sloshing around in your shoe and you’ve already been out there for twelve hours and you just want it to be over and you don’t want it to end. So train hard. Physically and mentally. And be prepared to go long, in a way that hasn’t been done before. The Abrupt Physics of Dying is published by Orenda Books and is available in paperback and ebook format.